Had one of those all too rare events at work where, due to enforced reboots (you know), we got told to head home at 4pm. Nice! I promptly pointed the pedals towards Futurama Park and the Waitrose cafe, mightily anxious to use my coffee & cake voucher expiring that very day. Made it, and that Marlborough bun had never tasted so sweet. Like old times, Andy's sat outside enjoying a sizeable sausage roll plus cheese straw when I eventually roll up, with a proper ice cream milkshake of which Richard and Maurice McDonald would be proud. Pizza slice for me with tomato & cheese & spinach and some Kettle Chips to offset that greenery. Very nice with a can of tropical Sunkist. Much activity either side with an impressive queue at Mann's, a local butcher for local people, and various vehicles entering and exiting Firman's garage. Nip in for cakestuff and emerged with a superior toffee meringue and, for retiree Andy, an old style cream puff, both with frothy coffees. 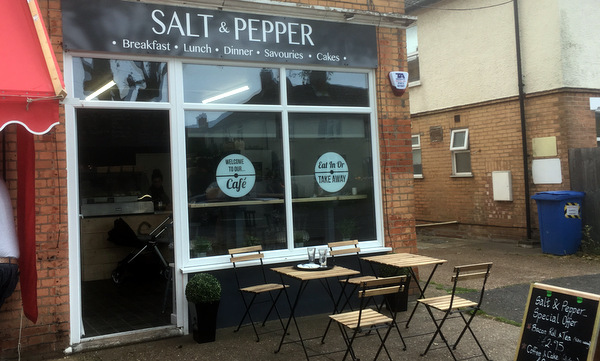 In the manner of these young people, Salt & Pepper already has a presence on that Instagram, and based on the launch leaflet should be open seven days a week. Gosh. Send your love to Lucy. If it was a car -- NanoFlowcell Quantino. If they were passing by -- Cheryl James and Sandra Denton.